Nepal, surrounded by the Himalayas, has long been a place for pilgrims and seekers from around the world. Nepal hosts an abundance of spiritual sites as well as awe-inspiring monuments. Between magnificent sunrises, eternal glaciers, and endless skies – the "Roof of the World" is a destination so sublime that it has inspired some of the greatest visionary explorers, poetics, scientists and philosophers for thousands of years. With its pristine landscape and peaceful surroundings – as well as an ancient legacy of some of the world’s oldest religions and cultures – it is the perfect locale for a soul-defining yoga and trekking retreat. Each day of the retreat will include a mix of challenging, but doable, treks and rejuvenating (though optional) yoga. We'll also work out our minds with meditation sessions in the beautiful mountain setting. ​If you love yoga and adventure, The Yoga Trek is the perfect combination of both. 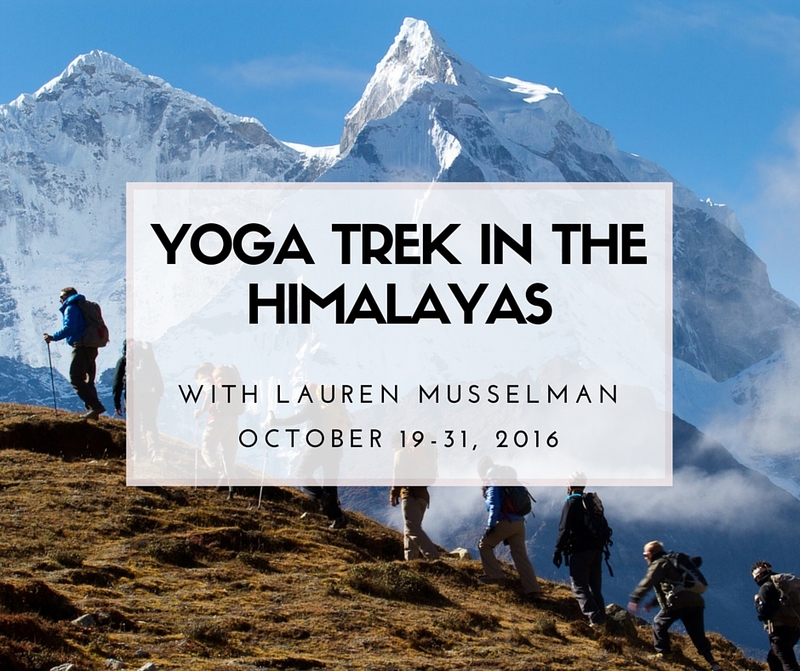 Join us for pilgrimage and practice in the sacred country of Nepal that includes restorative yoga and meditation classes, hiking beautiful mountains, relaxing in hot springs, exploring local villages, and eating delicious local food. Lauren, 500hr RYT from New York City, rounds out her resume with certifications in personal training and health coaching. An extensive background in hospitality coupled with a deep love for travel and adventure reflect Lauren's robust personality while yoga provides her with a catalyst to keep a healthy body and mind; it certainly proved to be the perfect recipe to feed Lauren's appetite for equanimity. My, personal, experience in Nepal was a pivotal moment in my adult life. For the first time ever I was challenging myself on all levels, mentally, physically, and spiritually. The treks are difficult, but doable for all body types, the daily yoga is optional so this is time you can have for your own practice or to practice alongside the others, and the journey is epic! I made connections with people I may have never otherwise come across and, more importantly, I connected to myself and to nature. Its the perfect opportunity to unplug - reconnect to mother earth - and challenge oneself. Upon our arrival in Kathmandu, a representative will pick you up from the airport and take you to Hotel. We will check all equipment and answer any questions you may have. In the evening there will be a yoga movement class on the roof top or yoga rooms. Overnight in Kathmandu. Dinner will be included. In the morning after yoga class, we will visit the Monkey Temple then onto Pashupatinath Temple, you will also visit Durbar Square to see the Heritage sights and the Boudhantha Stupa. Some guests will arrive on this day in which case they will be arranged with accommodation and have free time to rest from traveling. We will meet for group meeting & introductions as well as a short yoga/meditation class and dinner. Overnight in Kathmandu. Breakfast and Dinner will be included. After a morning yoga class and breakfast we take our bus to Pokhara, which will take approx. 6 hours. On arrival we will be escorted to our hotel and spend a leisurely evening in the beautiful lakeside town of Pokhara, with an evening meditation class. Overnight in Pokhara. Breakfast included; dinner suggestions will be made and guests can enjoy a stroll through town or sit by the water for a meal. Early morning yoga class, breakfast, and depart Pokhara at around 8:30 by private car. The road snakes through the scenic countryside for about 1.5 hours to the trekking trail head at Nayapul. This is the confluence of Modi river draining Annapurna base camp and Burungdi river. We follow upstream Burungdi river, climbing to Thikedunga. Thikedunga is a small charming village full of lodges where we will spend the night. Breakfast, Lunch, Dinner (B.L.D.) all included. We'll enjoy a morning yoga class, and then after breakfast, we will start our day's walk with steep climb to Ulleri village. From Ulleri the trail climbs gradually through the forest to Ghorepani at 2,800 m. Ghorepani is the mountain pass overlooking at the deep KaliGandaki valley wedged between two eight-thousand meter peaks of Dhaulagiri and Annapurna 1. Evening Meditation. B.L.D included. Early morning yoga class and breakfast before heading down to Modikhala River, where we will reach the picturesque bridge. You will have photo opportunities of the waterfalls and valleys, green hills and mountains, the most magnificent scenery of the Annapurna South and Himchuli. We will then trek to Naya pool, which is a beautiful village with more amazing views. After lunch, we'll drive back to Pokhara. Overnight in Pokhara. B.L. Visit the world peace stupa, go boating on the lake, visit caves, shopping, massage, or rest in this beautiful city. Morning yoga class and breakfast before saying goodbye to Pokhara and flying back to Kathmandu. In the evening you are invited to a cultural show and dinner. Overnight at Kathmandu. B.D. We are saying goodbye to the mountains as your journey in Nepal comes to an end today! There is nothing to do but trade emails with travel companions and organize the photos. If you have more time you can do some shopping or sightseeing. Breakfast included. Nepalese visa fee & Fee for sightseeing in monument in Kathmandu.